Hello today i have purchased the FAQ module but don't work ? - Updated the editor used from the module. - Stylizing changed on the admin part of the module. - Added Version Check System. More information about the module can be found here. For those who have already purchased it, we will offer to you a 10$ discount coupon code in order to use it on your next purchase. More information will be sent to you via email. Thanks for the free release! It can be downloaded via here. and it also doesn't show up in admin any Idea? Open the faq_index.tpl file and remove line 53. This will solve the error. Are you able to access the module here? Which is Strange since I uploaded the folders exactly in the structure gives! Get into your admin/modules/Faq folder and rename the FAQ.php file to faq.php. Some servers have some problems with the files names but changing the name of the file should solve the problem. runing on phpVMS Version v2.1.934-170-g5ca803a which is when remembering right a Beta? can you also try to rename that folder to faq (without caps)? There is a problem with the server connection. Please contact us. thanks a lot working now! For all those who viewed this conversation, i have made all of the required changes. If you have any problem, you can redownload the module from phpmods github account. how can I set visible for non logged in users? The module "FAQ" doesn't exist! Does the core/modules/FAQ/Faq.php file exists on your website's directory? Tried to install Version 1.2 and I get this error from FAQ downloaded from Github. 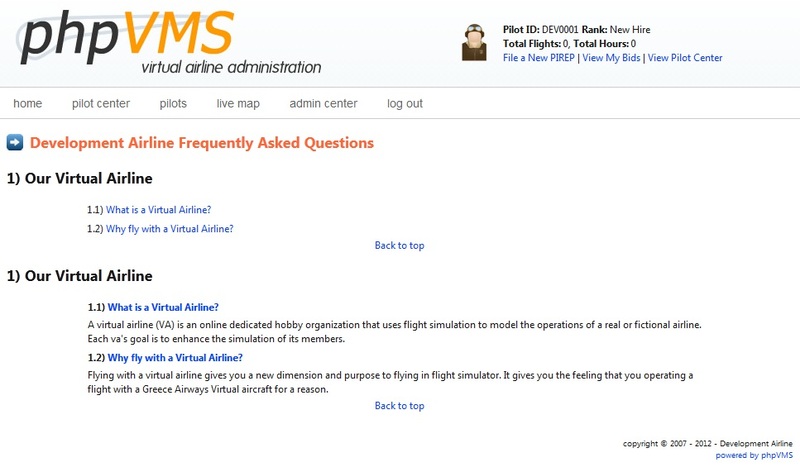 We would like to thank you for using our FAQ System Module developed for phpVMS. We are always trying to offer the best solutions for your virtual airlines. The modules we have developed for phpVMS (either freeware or payware) can be found on our website. This does not affect the functionality of the module. It has to do with the check update system. You should not receive the error now. Thank you very letting me know. Yes. Miraculously working fine now. Thanks. Hello, i download this module. But it shows each item twice. See the picture please. The questions above are used as an index while below are the answers. Alternatively, check this. The questions are links and as soon as you press them, you are linked to the answer.